Private tutoring, group classes, and workshops. Classes benefit all levels of prior experience and training. Have fun, or delve deeply. Manhattan NYC, phone or Zoom video conference. mp4s and mp3s provided. WHAT IS FEROL HUMPHREY TAROT METHOD? Ferol Humphrey Method Level One is the best way to gain ease and confidence with your Tarot deck, right now! After the incredibly fast development you experience in one month, you may spend the rest of your life calmly, confidently handling your cards. This class is also for very experienced readers, professionals, and instructors. Meanings are not taught in this class. It is experiential. Direct practice in class quickly sparks your intuition to help you move along much more easily in Tarot and in life. We use Ferol Humphrey Tarot Method Blurt Drills in every single class. FHTM is a highly original, innovative, and very effective process for stepping out of restricting cultural programming to rediscover your own imagination and creative freedom. This process is widely regarded as outstanding for quickly gaining reading skill in Tarot, and showing itself in other aspects of life such as quicker and more natural response in your work or home settings~ wherever other people and ideas are moving quickly. Join the class and find out why it moves us on to bigger and better things so QUICKLY. One month is all you need to get started, but most students learn so much and have so much fun that they move forward through three months of certified instruction. Ferol Humphrey Tarot Method is a totally unique, original, fast, and very effective teaching method in 3 modules. Each module contains three Levels of skill, 8-10 hours total per level~ by appointment, or in 4 regular weekly classes. Individual Levels are carefully tuned to you and your fellow students as a group. Ferol Humphrey Tarot Method is easy, and FUN! You may set up anything, from an introductory one-hour class to ongoing private tutoring. I travel. I would love to talk to you about a visit to your area. You can have this unique growth experience and share it with your friends. This is fun, practical, fast and easy, for stone-cold beginners and experts alike. It changes our perceptions in an atmosphere of enjoyment and discovery. Join us! $200 per Level, or prepay full module for discount. For Level One, all students use the Universal Waite or Radiant Waite Tarot deck. Further Levels move on to any deck you love. Ferol Humphrey Tarot Method is something I have taken all over the world. People get a huge kick out of it, and learn lots. It helps you change your approach to living, too, so that you have more fun, relax, and trust your own judgment. Learn more about Ferol Humphrey Method further down this page. This 3-Level Module is a dynamic, personal journey for one person, or a small group. Students encounter a wide spectrum of activities, from private consultations to parties. Each reader has a chance to test their abilities with the public before going solo. This module is very interactive, involves meeting clients in a supervised setting both public and private. We address several different styles of presentation, as well as handling disruptions and difficult clients, and navigating the many responses people have to receiving Tarot readings for a fee. Inquire for more details. This 4-month private tutoring may be prepaid for $600, a $200 discount. ​I offer basic concepts of the Tree of Life, a beautiful way of thinking about the Story of Life in the Universe~ a creation story, which can used by anyone of any faith, philosophy, or spiritual path. Birth Cards in the Tarot~ a correspondence to the Trees of Light and Shadow~ the Kabbalah Trees~ ideas useful and practical in daily life. Our discussions will use non-sectarian terminology while still exploring a specific world view. You will not need to reference any secondary cultural system to enjoy the class. This is not hermetic qabalah. The class is Ferol Humphrey Method, which is a pleasant surprise for most students. If you are familiar in a general way with the Trumps or Majors of Tarot, then you will be just fine in this introductory class which relates your personal Birth Cards to the Tree of Light. The class will provide a very good, basic working understanding of both Birth Cards and the Tree of Life, as they relate together, for YOU. Your Tarot Birth Cards give you really strong, reliable information about your strengths and opportunities as you progress through the years, and seeing how this works on the Tree of Life can provide many aha! moments and help you to gather yourself forward. I personally find the Birth Card material to be one of the most profoundly helpful ways of the using the Tarot. I refer it constantly in my own life to surmount obstacles, use my powers of perception and wisdom, and find solutions where I might otherwise be overwhelmed or scattered. Tarot Birth Cards rock! Add to this the power of the Tree of Life, and perspective is gained very quickly~ when to speed up, when to slow down, and how to interpret what is going on inside of you. Ferol Humphrey Method makes what would otherwise be highly complicated material available to you right now, easily. Students use any Tarot deck with the word "Waite" in the title: Universal Waite, Rider Waite, Original Rider Waite Tarot Pack, Pamela Coleman Smith Commemorative Set, Radiant Waite. 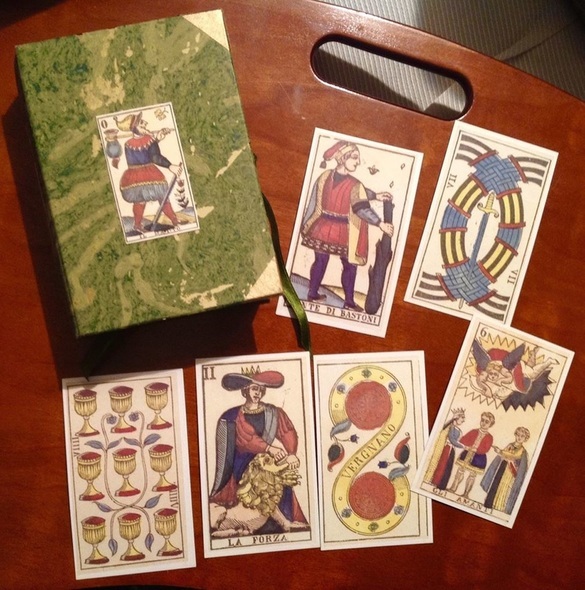 Also, Tarot de Marseille and Thoth Tarot decks are just fine, as they are standards. During a phone class we often exchange photos by cell phone, so working with standard decks which we all recognize is a plus. Part One: Your Personal Birth Cards on the Tree of Light. Students agree to attend the four classes on time and with a minimum of distractions. Part Two relates your personal Birth Cards to the Shadow Tree. This is unusual material and almost unavailable up until now. The Shadow of the Heart, The Shadow of Victory, The Shadow of Wisdom, The Shadow of Valour~ what would these be, to YOU? Do you ever feel that you are Failing and Falling? Students will discover how to rely on their Birth Cards when they find themselves experiencing or facing the Shadow elements of life. On the Shadow Tree each center of energy expresses the Shadow elements of the corresponding position on the Tree of Light. The Shadow of Ourselves! No matter how much we may wish to ignore or reject the Shadow, it is all part of the grandeur of life, and also quite inescapable, so why not learn how to deal with it and understand it, in ourselves and in the world around us. You will see your own reactions and responses more clearly when these dark and perplexing situations arise in your life. Your Personal Birth Cards on the Tree of Shadow~ an outstanding practical assistance for people who wish to experience life with wisdom and power. I must tell you, when I first tested this material with others in New York in 2013, I was floored! I have used it continually since then, to my advantage, and that is why I am teaching it now. OR Intake Interview and Assessment based on prior knowledge and experience, up to 30 minutes at no charge. We will examine using Tarot to create a relationship beyond the self, with the Universe, however you personally may experience that. This class is not about "believing in Tarot", whatever that is. We will be using artwork to listen to our inner selves. We will look deeply into Tarot as a transpersonal system of experience. Transpersonal~ Beyond the self! This should be a fascinating class full of discovery and sharing, with insights and surprises provided by the students themselves. I will guide you in a way of thinking, experiencing, exploring. Come along, on a Transpersonal Journey with Ferol Humphrey Method. Calling all Tarot de Marseille fans! the longest-used version of Tarot. any Tarot de Marseille style deck for this class. but been unsure what to do with "non-scenic" Minors~ which show symbols rather than pictures? to make you comfortable doing just that. delivering meaning and value for yourself or others. Choose your module, or learn the topic you want, in your own way, with personal attention and instruction, every session. Playful techniques build your confidence and skill very quickly. Evening classes. Direct practice with the cards, very intriguing and fun. No memorizing or study. It works very quickly! By phone or in New York City surrounds. Phone tutoring is great for those who want to learn on the road, or at home. $320 eight 1-hour twice-weekly sessions. $250 four 2-hour weekly sessions. $80. Workshop runs 7:00-11:00pm EST. Early Bird Enrollment till 15th of month. $60 at the door, once the 4-student workshop minimum attendance has been met. Students may enroll for the coming month, during the current month's workshop, at a discount. and what we COULD do, how would things change for us? which would fulfill our emotional, mental, physical, and spiritual needs. We will dare to design what sounds great to us, and then see if we can map it from here to there. We let our inner dog off the leash, and see what happens. If your group of 4 or more would like to meet and learn with me, I will set up a class for you. Those of you who feel that you read Tarot moderately well should feel very comfortable in this class. However, we find that even absolute beginners do very well in this total immersion adventure with the cards. Bring your favorite books, decks, bling, journals, lesson plans as instructors, or whatever you have, to share with this gang of high-spirited, dedicated intuitive readers. We are building community and relationships, so if you are tired of being isolated with your passion, and looking for some new friends and potential highjinks, you'll love it. Those who read a little bit of Tarot, those who excel, and anyone in between, enjoy a night of Tarot Tomfoolery with Ferol Humphrey Method. Why not! Let's party! This is a fully-experiential throwdown. I will provide instructions, and everyone participates in some Tarot nonsense which makes you MUCH better readers. FreeConferencing instructions are provided by email when you enroll. All material on this site copyright Ferol Humphrey, 2011-2018. All rights are reserved. If you wish to quote material briefly for use in an educational or blog article, please attribute to me, and link back to this site.